It is with sorrow and sympathy that the Cavett family shares the peaceful passing of Donald Turpin Cavett on Thursday, March 28. Donald Cavett passed away March 28. His wake will be on Thursday, April 4 and his funeral on Friday, April 5. Donald, 85 years old, was a longtime resident and employee of the Town of Darien. Don was born on May 12, 1933 in Lynn, Massachusetts to the late Edwin and Cornelia Cavett, and he spent his childhood years growing up in Marblehead, Massachusetts. After graduating from St. John’s Prep. of Danvers, Massachusetts, in 1951, he went on to receive his bachelor of science in Commerce from the University of Notre Dame, in 1955, and later pursued an MBA at Boston College. Don was married to his beloved wife Joan Cavett in 1961 and spent 57 wonderful years together raising their two sons: Donald Cavett Jr., born in 1962, and Douglas Cavett, born in 1965. Don was a pioneer in what we now commonly refer to as the Global Economy, working with the United Fruit Company as an international financial officer in the Boston, New York City and Costa Rican headquarters, he frequently traveled to London, Rotterdam, Amsterdam and Milan to consult at those regional headquarters as well. He loved experiencing the unique cultures of the world and tried to assimilate as much as he could with the local people to best understand how his position could enhance their lives. He always put the environment and others first, and he championed the idea of recycling and paying-it-forward long before they were fashionably accepted practices. His work to protect the environment and support his community led him into an unexpected position on the Marblehead, Massachusetts Planning Board, where he successfully preserved hundreds of acres of forest and wetlands. Don’s true passion, and a life-long dream of playing the bagpipes, finally came into fruition when he left the corporate world to freelance as a financial consultant in Fairfield County. He was a founding member of the Gaelic Pipe & Drum Band, the Shamrogues (a traditional Irish musical group) and the Glee Club, which performed for audiences as far away as Ireland. Don loved to celebrate St. Patrick’s Day, and he brought that celebration of Irish music to people all throughout the entire Month of March. He also played year-long for weddings, funerals and parades in Connecticut, Massachusetts, New York and Georgia. 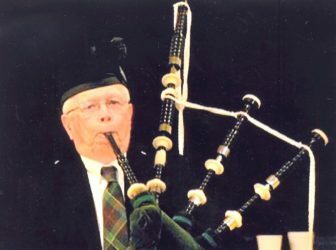 He was a proud member of the Gaelic American Club in Fairfield and enjoyed playing music there as often as he was able. Don was also a proud member of the University of Notre Dame Alumni Club of Fairfield County, the Sons of the American Revolution (SAR), the Knights of Columbus, the American Legion, the Middlesex Genealogical Society and a Veteran of the U.S. Navy. He is survived by his loving wife, Joan Cavett of Darien; sons: Don Jr. (and wife, Diane Cavett) of Richardson, Texas; and Douglas Cavett of Burlington, Vermont; grandchildren: Courtenay Cavett of Richardson and Trevor Cavett of Little Compton, Rhode Island. Calling hours will be from 6 to 8 p.m., Thursday, April 4, 2019 at the Edward Lawrence Funeral Home, 2119 Post Road, Darien. A Memorial Mass will take place at 1:30 p.m., April 5 at St. John Roman Catholic Church, 1986 Post Road, Darien, on Friday, April 5. Don will be buried in the Waterside Cemetery in Marblehead. In lieu of flowers, Don would have been grateful to have all donations made to the Middlesex Middle School-Donald Cavett Music Scholarship, 204 Hollow Tree Ridge Road, Darien 06820 and/or Post 53 Darien Emergency Medical Service, P. O. Box 2066, Darien 06820.